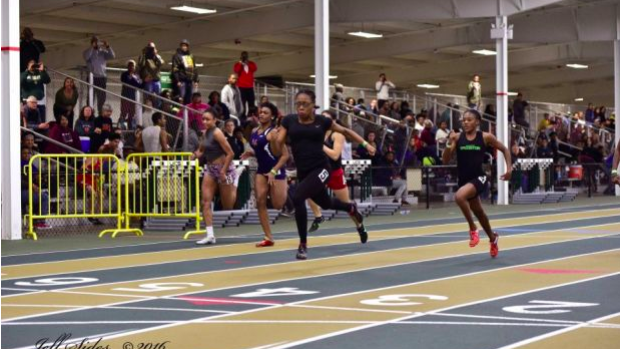 What To Watch For At the NCHSAA 3A Indoor State Championships! Charnessa Reid (Mt. Tabor) was a contender last year in 4A. Now she moves down to 3A and is a pretty heavy favorite with a seed time of 8.24, well faster than the rest of the field. But it is the hurdles, anything can happen and just hitting one hurdle can open the door for the rest of the field. Nylie Facey (Southwest Guilford), Alexis Patterson (Parkland) and Eryka Baker (Dudley) are not too far behind, and will be ready for the upset tomorrow morning. These three girls have all run under 8.54 this indoor season. Jordan Sales (J.H. Rose) has come on strong towards the end of the indoor season running 7.15 two weeks ago. She'll face off with emerging star Alyson Davis (Northern Guilford) who has run 7.19 under FAT timing in her first indoor track season. This will be a toss up between Del'Nique Penn (Parkland), Alexis Patterson and freshman Jordyn Case (Weddington). Penn has run 7.20 and Case 7.23 this indoor season. Sales holds a PR from her freshman year of 7.08 and should be closer to that this weekend. This looked to be a major matchup, but no Alysia Johnson, no Kiya Oviosun entered who are the top two girls in NC in the event. This opens the door for many girls to push for an indoor title in Alexis Patterson (Parkland) who has run 40.51, Jessica Wright (Hillside) and Jordan Sales (J.H. Rose). All three girls have run under 41 seconds this season and will likely need to get under 40 tomorrow in order to win the 300 title. Olivia Cooney (South Iredell) came out of no where last weekend running 1:14.20 for the 500 for a new state lead when you include hand times. She'll face off against last years outdoor 300m Hurdle State Champ Jessica Wright (Hillside), Jorja Medders (Marvin Ridge) and star sophomore Megan Marvin (Chapel Hill). If Cooney is able to run 1:14 tomorrow it's hard to see her losing, as it'll be one of the fastest 500s in state history. This should certainly be one of the faster 500s in the state from this year.